FedEx is known for making delivery deadlines and accident headlines. The transportation company has been much in the news lately for accidents caused mostly by distracted or drowsy drivers, the result of tight deadlines and lax safety concerns. A new pair of accidents highlights the company’s driver safety issues and raises new concerns regarding commercial hauling altogether. On December 29, FedEx driver Stephen McMaster of Murfreesboro was traveling north on Wilson Pike. He turned onto a private drive at the same time a CXS freight train began crossing the grade. Needless to say, McMaster’s truck didn’t stand a chance; the front end was completely shattered and the truck flipped nearly upside down. McMaster was lucky; he sustained non-life-threatening injuries and was in stable condition as of this writing. While these accidents certainly don’t herald a new era of dangerous railroad crossings, they do bring attention to an often-overlooked threat. We’re so conditioned to respond to traffic signals that most of us don’t look for trains when we approach tracks. Stephen McMaster was struck at a private crossing that didn’t require warning lights or gates; the driver in Utah was struck when the warning lights and gates failed to operate. In both cases, simply looking both ways could have prevented a serious accident. The numbers don’t lie; according to Operation Lifesaver, a non-profit group dedicated to reducing fatalities on and around railroad tracks, someone in the United States is hit by a train every three hours. 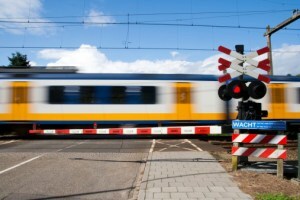 In a collision, people, cars, and even commercial trucks don’t stand a chance against a train. At the Rocky McElhaney Law Firm, we fight on behalf of accident victims throughout Tennessee. Our Gladiators in Suits will fight for you, too. To schedule a free consultation with a skilled injury attorney in Nashville, Gallatin or Knoxville, call us at 615.246.5549, or fill out our contact form.